With its very attractive design, the Hartwood 7′ x 5′ FSC Pent Shed is a structure that is going to make your garden have that little bit extra style as well as offering you a place to store a number of different things. 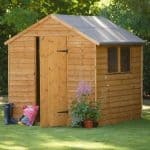 This is a shed that due to its size can easily be installed into any size of garden. Its pent roof gives you all the headroom you could need so being inside the shed is never going to be an uncomfortable experience. Impressively the door is wide and high enough to make it so even getting a lawn mower in the shed is going to be easy. 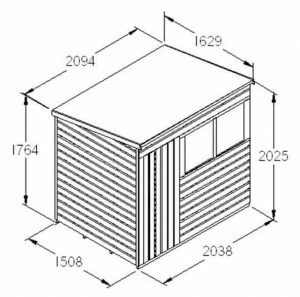 The shed will be illuminated by natural light thanks to those two shatterproof styrene windows on the front. Even though that tongue and groove shiplap cladding has a very easy on the eyes look to it. This is a shed that is just incredibly strong. That cladding is 12 mm thick and is backed up with a frame that is thick and robust, making this one of the strongest and most long lasting sheds on the market right now. The floor and the roof are made with the same kind of boarding which is able to take a vast amount of weight. 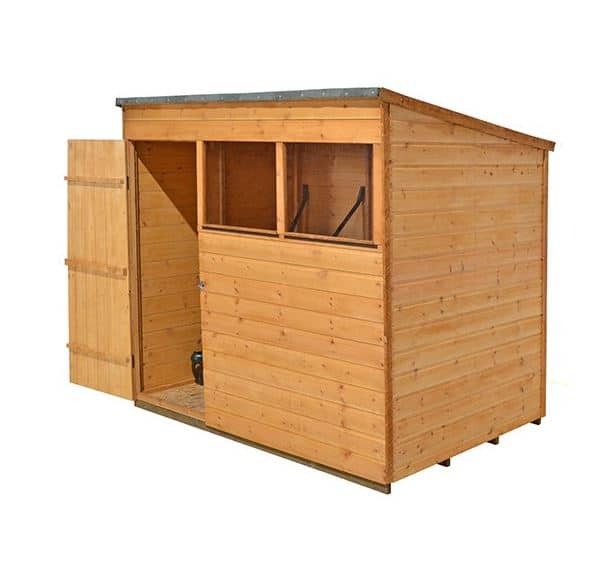 The Hartwood 7′ x 5′ FSC Pent Shed is a structure that is going to give you that much wanted storage space for your mower, tools and other items, but it also has one very attractive design so it is also going to be a very positive feature in your garden that is sure to get a few jealous looks from the neighbours. This is not a large shed by any means, but it is certainly a step up from some of the other more compact sized sheds we have seen. The width is an impressive, 6 feet 10 inches and the depth is 5 feet 4 inches so even though this on paper does sound a little snug, you can actually store many different things inside here. Due to the design of the roof there is a generous amount of headroom inside the shed with the front being a very impressive 6 feet 8 inches, even as the roof slopes towards the back the height is 5 feet 8 inches. The pent roof is going to protect your belongings very well. It slopes towards the back of the shed to keep the rain from pooling on top and also from running down the front of it. Construction wise, they have done a great job in using materials that are strong, but also very cost effective which you wallet is going to be thankful for. Solid sheet boarding and a covering of some very nice looking, green mineral felt is what is used for the roof and it is a design that we really like. It is the cladding which really sets this shed apart from all the rest as they have used this just drop dead gorgeous, 12 mm thick tongue and groove shiplap cladding. To start with this cladding looks incredible as it gives the shed such a smooth and high quality look. It also makes it watertight thanks to the way that the boards are so tightly interlocked together allow for no nooks or crannies for the rain to get in. The cladding on its own is very strong and robust, but when you add in the 28 mm x 28 mm frame that stands with it, you have one very impressively made and long lasting shed. The frame may not be something that is all that exciting to talk about, but you can rest assure that it is just going to quietly keep this shed strong without you really noticing it is there. The solid sheet boarding that they have used for the floor is the same kind of boarding that is used for the roof. Honestly while this may not be as easy on the eyes as tongue and groove boarding. It is still more than strong enough to take the weight of a vast amount of heavy items and it also does help them be able to sell this at an affordable price. The shed does not just sit on the floor as they have made use of some very impressive floor joists to help support the floor. The Hartwood 7′ x 5′ FSC Pent Shed does only come with a very basic form of treatment that is designed to protect it in the short term. So you are going to have to get a tub of wood treatment and give the shed a real, thorough coating in order to keep it protected against rot and decay. 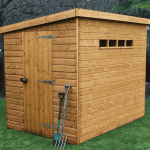 As long as you do treat the shed on a regular basis, we are not talking once a week, but just once a year, then you will be covered by a ten year anti rot guarantee. 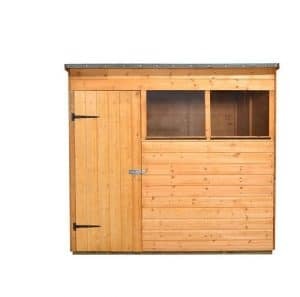 It may only be a single door, but at 5 feet 7 inches high and 2 feet 2 inches wide, you will be able to get larger items into and out of the shed without much of a struggle. The door is well made and is actually far stronger than the pictures suggest. This is because the door is supported with three braces and a set of heavy duty hinges. While we do like the door, we think that a small window on it would have finished the front of the shed of nicely. The front of the shed has two decent sized windows that are going to allow a lot of light into the shed. These windows are not glass, they are made from shatterproof styrene that will not turn that yucky yellow colour other plastic windows tend to do and also they will not smash into a million pieces when the kids kick a ball at them. They are fixed windows so you cannot open them, but at this price we really cannot be too harsh on them for that. One very pleasant surprise is the inclusion of a pad bolt which will make sure that even in the wildest wind that the door stays shut. This does not lock the door so if you do want to keep your items securely locked away then you will have to look into adding some kind of locking mechanism. 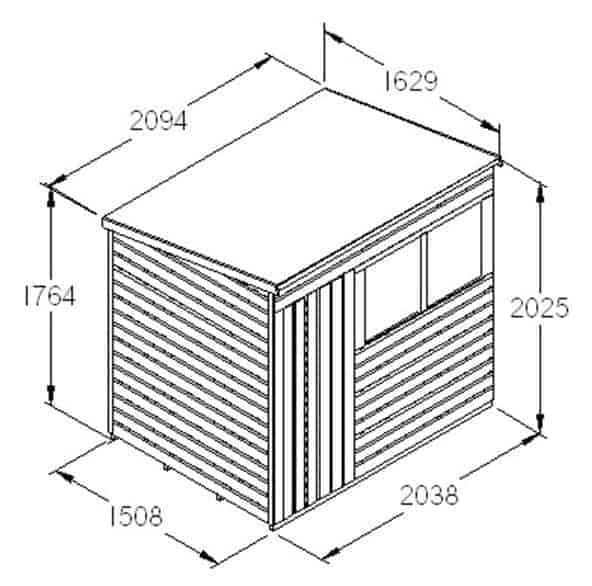 The design of the front of the shed does mean that if you do have the shed facing the street or the neighbours then people may be able to look inside. If this is something that does concern you then consider adding a set of blinds, curtains or even some really cool looking flag such as an eagle riding a motorbike, of course getting this approved by your other half may be easier said than done. This is a shed that is actually really easy to customise as you can change the colour of the shed when you come to treat it. With wood treatment being available in pretty much any colour you could want it has never been easier to protect and stylise your shed at the same time. A Yale brand hasp and padlock set can be added to the shed for a cost of £19.99. This is a decent price for such a high quality lock and something to consider if you do want to ensure your belonging are well protected. 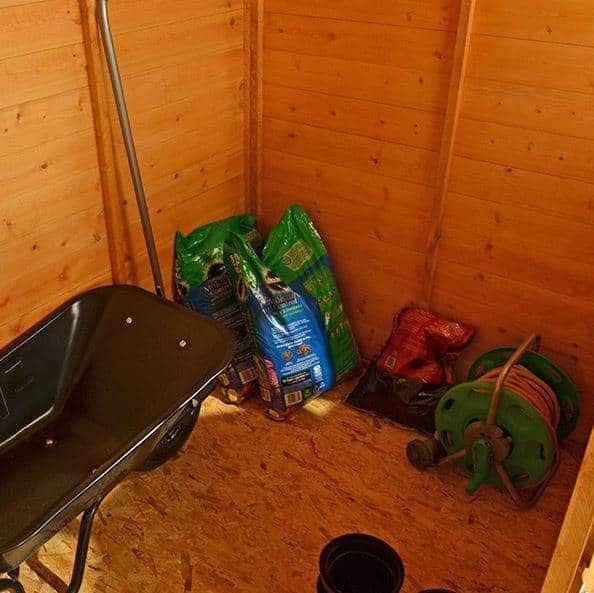 The flooring can be given extra support with their plastic shed base which costs £69.99. This though we would say is only worth considering if you are installing the shed on grass and a little worried about this. We just love the overall design of this shed and are just blown away at how high quality it is. While you will have to do a little work to keep the shed protected against rot. 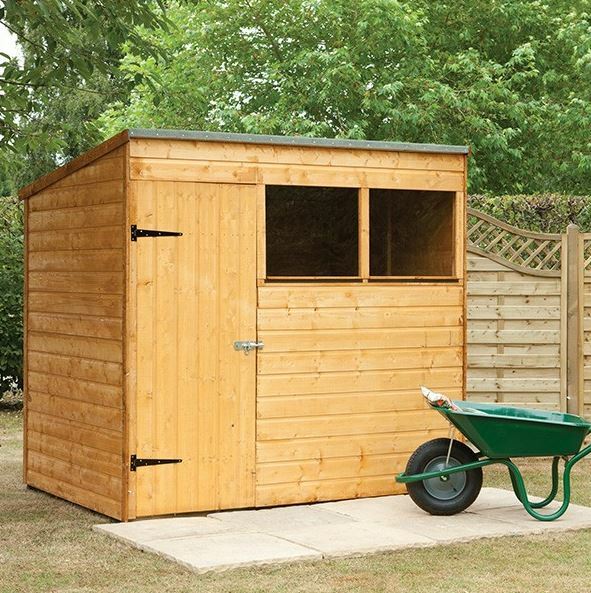 In general this is one very long lasting shed that is going to be more than happy for you to throw things into it for many years. You will have to carefully store your items to get the best out of the space offered, but even for a compact sized shed this still offers you a decent amount of storage space. With the help of a friend who you can stand being with for at the most 6 hours, installing this shed will be a pretty stress free and straightforward process. Just make sure that the snacks and drinks keep on flowing. 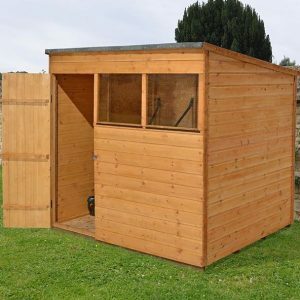 The shed may be a little on the small size which may make some of you question the asking price, but this is one very well made shed that is going to give you many years of service. 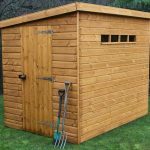 Final Thoughts: While it is not the largest shed we have seen, the Hartwood 7' x 5' FSC Pent Shed was still a structure that really did impress us. 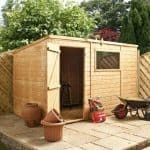 They have really done a great job in making a shed that walks the fine line of being something that is going to be an aesthetically pleasing feature of your garden and also being something that is strong and practical. 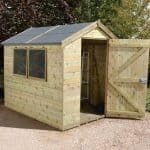 For smaller gardens this is one of the best looking and well made sheds that you can get and even for a larger garden, we feel that having this sitting in a corner somewhere would look amazing. 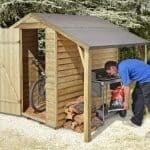 In all this is a shed that is very easy for us to recommend if you are looking for something that has both style and quality.